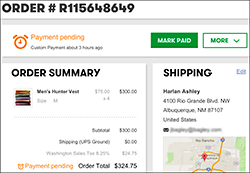 Use these steps to see and change customer order information to find an order, change shipping information, cancel an order, and print an invoice. From the Sales menu, click Orders to see the status of customers' orders. Note: If you want to look for a particular order, use the search fields at the top of the Orders page. Click the Order # menu to find it by Order number, or use the Start and Stop date fields. You also can click any column label to sort all the orders by that value. Click any order in the list to see its details, including the customer's shipping address and recent orders. Click Edit if you need to change a customer's Shipping Information. After making changes, click Save to close the pop-up window and return to the order. 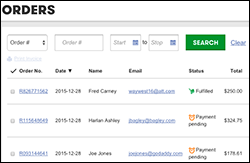 You can click the More menu in the upper right of any product page to Print Invoice or Cancel Order. Note: The Online Store does not generate a refund to the customer when you cancel an order. You'll need to do that using your Stripe or PayPal account.